I run ads on this blog from two ad networks; Federated Media and FeedBurner. They sell the ads and serve them on this blog. I get the opportunity to approve the ads and occasionally I do decline ads but not very often. Last month there were ads running on this blog from Compete and Hitwise, two companies that compete with my portfolio company comScore. I thought for a while before approving those ads but I eventually did because I feel that my readers are very interested in web traffic reporting services and that the Compete and Hitwise ads are way more relevant to them than most of the ads that appear on this blog. That caused a bit of consternation among some of the employees at comScore. I heard questions like "is Fred actually promoting the services of companies that compete with us?". I am going to think even harder before approving ads for companies that compete with my portfolio going forward because now I am sensitized to the conflicting messages that ads on this blog can send. As a "publisher" I’d like even more control over the ads that run on this blog. Today it’s pretty binary. Either they run or they don’t. Nothing in between. Frankly I’d like to be able to "favorite"certain ads. Like this one running on my blog via FeedBurner right now. This is a great looking ad and a great looking product. Frankly I want that product and I’d bet that more than a few of you all do too. So I should be able to click on the ad and favorite it and make it run more often than it would normally run on this blog. comScore should buy some ads from FeedBurner and Federated Media to run on my blog and if possible, I’d favorite them. Compete and Hitwise should be able to get their message out on this blog, but I’d favor comScore ads for sure because it’s the superior service. But we can take this idea even further – to the audience side of the equation. Advertisers want to measure engagement without relying on clickthrough rates which aren’t always the best measure of advertising effectiveness. Then why not offer the audience the opportunity to favorite the ads? And make it mean something. If you favorite an ad, you’ll see it twice the rate of all other ads for example. I am not going to click on this Blackberry Curve ad. I don’t want to disrupt my workflow right now. But believe me, this ad has made an impact on me. 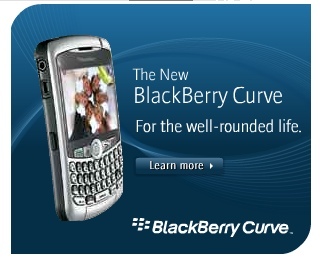 At some point, I am going to go out and get me one of these curve phones. Let me favorite the ad and reinforce that decision without impacting my workflow. The advertising industry needs to take some lessons from social media. Clicking isn’t the only engagement with media that matters on the web. Commenting, favoriting, tagging, sharing, and many more engagement actions are important. We need to bring these actions into the hands of the publisher and the audience. It will make for a much better advertising experience for all of us.